Vacation To Molana In The Maluku islands - Molana Island is a small island located in the Saparua District, Central Maluku Regency, Maluku Province, Indonesia. This island is a coral island that sticks to the surface of the sea and becomes a very beautiful land. The white sand that lies north of the shoreline on this island is unique because it moves according to the wind season. In the east wind season the sandy beach will be on the west side. Whereas in the west wind season the sandy beach moves to the east side. This massive sand movement is thought to occur because the granules of Montana Island are very fine as powder. How do you free yourself from the busy and frustrating activities of your city from traffic jams, noise, polluted air, scattered garbage everywhere and so on? If you are already saturated with the annoying city life and want to find a quiet place, with clean, beautiful and comfortable air or dipping into clear sea water and beautiful beaches like heaven then Molana Island is the perfect place for you to let go of tired from a very annoying city life. This Ambon island Indonesia with a combination of clean white sandy beaches and sparkling clear and calm sea water and beautiful views of the sea is a great place for you to have a vacation. In addition, there are many forests on the rocky terrain. There are at least 85 species of trees growing on this island including rare plants and rare animals such as the Pacific Monitor Lizard (Varanus Indicus), Moling Scrubfowl (Megapodius Reinwarditii) so that it is suitable for those who like hiking and adventure while relaxing in a peaceful environment. 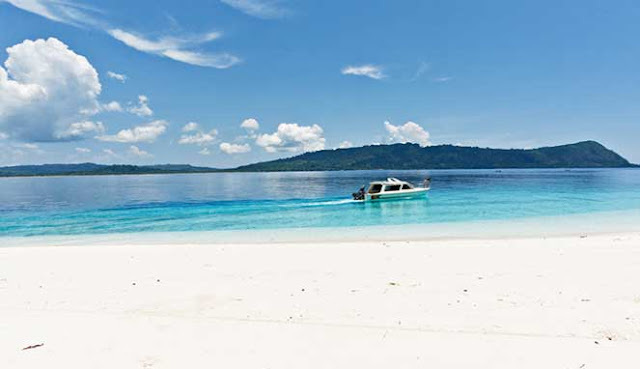 This Ambon island tourism is an uninhabited island covering an area of around 160 hectares. It has been known since the Portuguese colonial era. The island still contains the ruins of a hospital built during the Dutch colonial period whose construction was destroyed during the Japanese occupation in World War II. 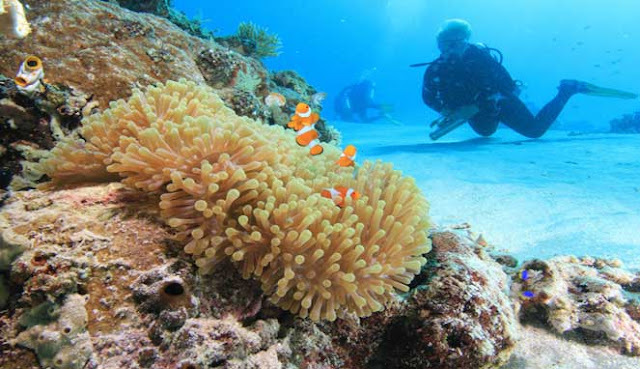 Besides being able to enjoy historical and adventure tours, on the island of Ambon, Montana, you can also do snorkeling activities in the clear and shallow water with the sunny weather making your snorkeling experience feel memorable. In addition, on the Maluku island, Montana holds large coral clusters that appear on the surface. Here you will find rich underwater life everywhere around this island. The most popular places are on the north and southeast sides of Montana Island. Here you will find the Underwater Goa which is connected to the well in the middle of the island. If you are really an underwater enthusiast, then don't miss other famous places in Maluku island Indonesia around Nusa Laut, Saparua Island, and Haruku Island to explore this amazing underwater. Molana Island is a part of Lease Island with Ambon Island, Haruku, Saparua and Nusa Laut that you most likely landed in Ambon City. Look for a guide to get to Molana Island to guide your tour to the most interesting part of the island, both cultural tourism and natural beauty. Most Maluku islands, Molana are covered by forests and bushes on the reef. You can explore it to find the best sunsets and sunrises on the cliffs or meet the Montana Island Original Fauna. Or you can spend the night with traditional music and bonfires. The Molana Strait is only 4 kilometers from Molana to Saparua. If you are a professional sea diving you can try it because safety procedures are available here. The easiest way to get to Montana Island is to ask the crew to pick you up at Ambon Maluku islands airport. 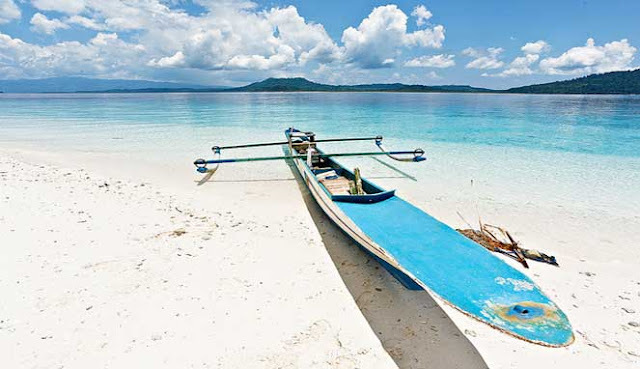 Molana Island is part of the Lease Islands in Maluku. The nearest Maluku islands airport is Pattimura Airport in Ambon, Maluku Province, Indonesia. Or from Pattimura Airport before 7 am if you want to take a fast boat to Haira. Use a Taxi from the Airport to Tulehu Harbor (travel about 45 minutes). Buy a fast Ferrari ticket to Haira. Ferri ship will depart from Tulehu at around 9 am every day. From Haira you can use a speedboat to Molana Island with a journey of around 20 minutes or from Tulehu. You can rent a speedboat to go directly to Molana Island.